A new kid on the block, Kyuu by Shunsui has opened at Keong Saik Road. From the same group that manages Five Nines and Kappo Shunsui, Kyuu has taken over the space of Five Nines, with Five Nines relocating to Cuppage Plaza. 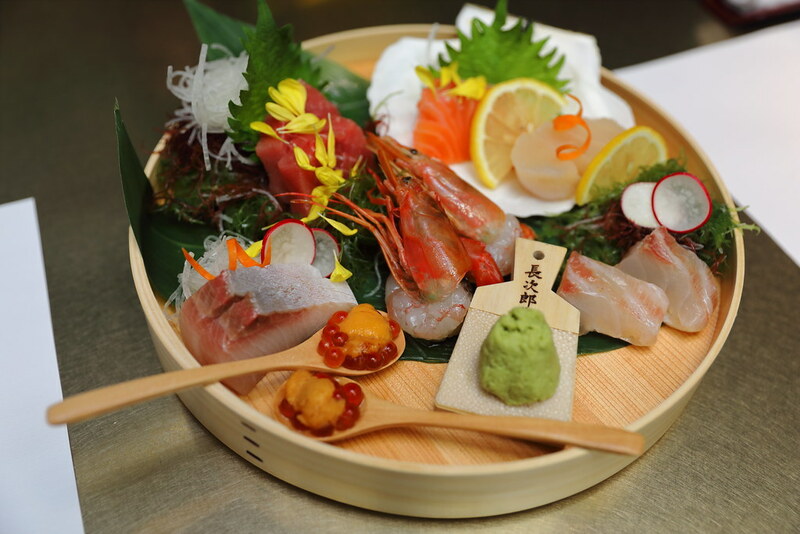 Kyuu is helmed by Chef Issey Araki, formerly from one Michelin starred restaurant Akasaka Tantei in Tokyo, Japan. 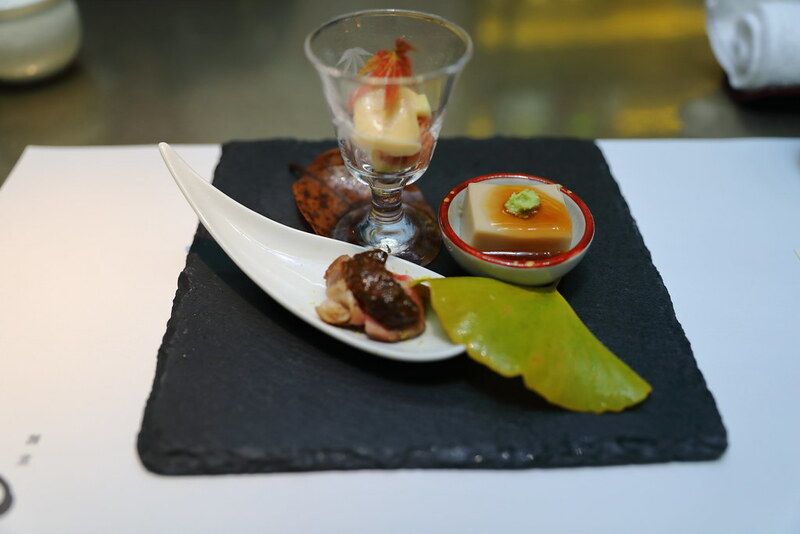 The restaurants offers a tantalising ten-course Omakase menu priced at $129. A la carte menu is also available. We started with 3 Kinds of Appetizer. On the plate, you can find Soft Simmered Duck topped with homemade miso, Homemade Sesame Tofu covered with starchy sauce and wasabi, and Fresh Fig with Sumiso. A delicate plate of appetizer to kick start the dinner. Next is Assorted Sashimi. The fresh plate of sashimi consists of Tuna Fatty Belly, Red Snapper, Salmon, Sea Urchin, Yellow Tail, Red Shrimp, Scallop and Salmon Roe. You can't get any fresher with this seasonal catch on the plate. By the way, above photo is 2 pax sharing portion. Moving to the charcoal grill items, we started with the Eggplant with Sweet Red Miso. Eggplant if not done correctly will be mushy and unpleasant on the palate. The eggplant here still retained a crunchy bite. 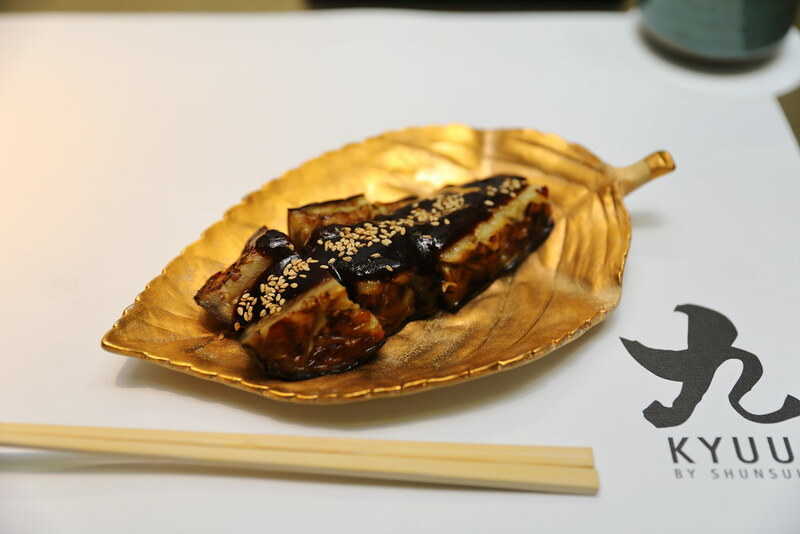 The sweet red miso sauce with sesame on the grilled eggplant, felt like having our local chee cheong fun. 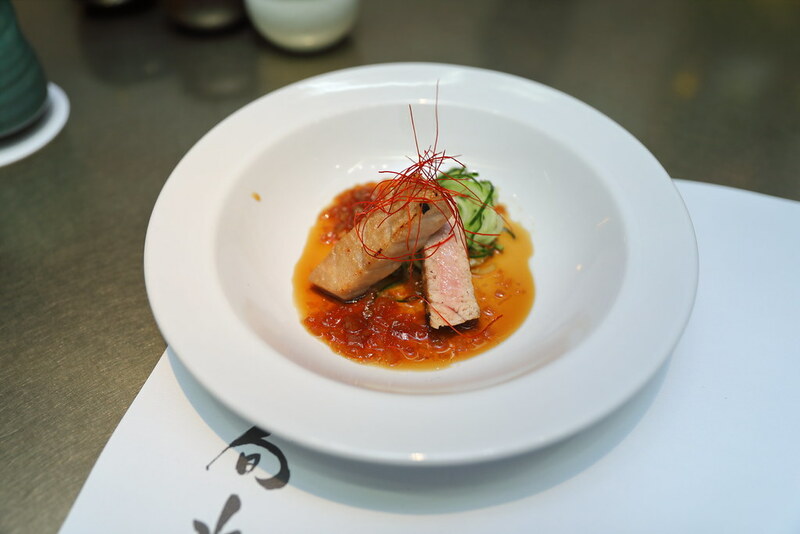 The truffle ponzu sauce complemented the grilled Tuna Belly excellently. It lends a zesty tanginess to the smokiness of the grilled tuna belly. The accompanying cucumber provides the extra crunch to the dish. 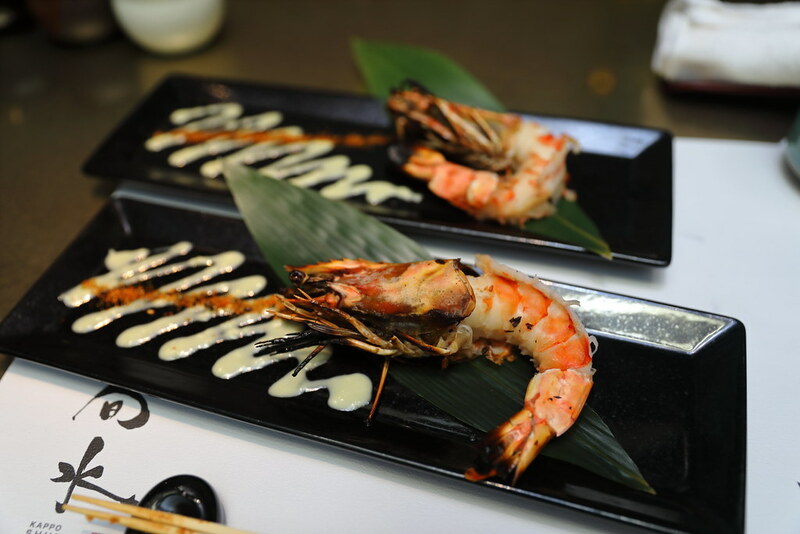 Grilled to perfection is the Big Size Prawn with Wasabi Sauce. It is sweet, smokey and crunchy. 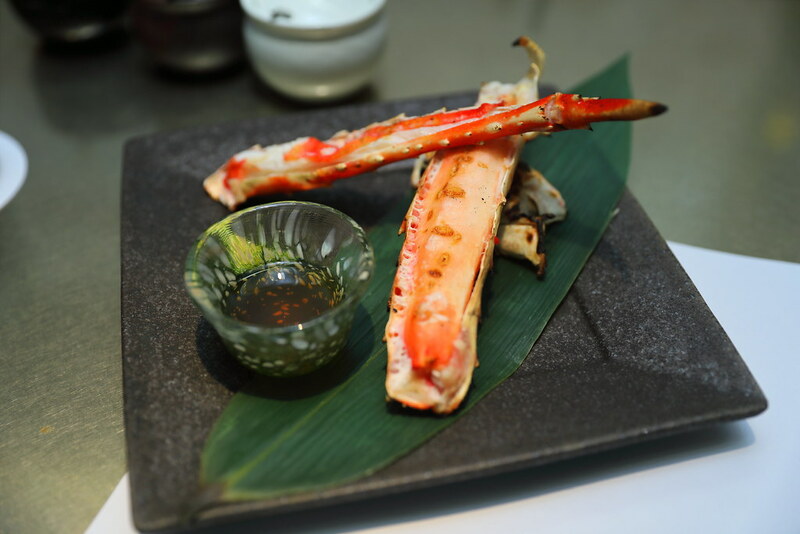 One of my favourite items from the omakase menu is the King Crab with Vinegar and Sudachi Lime. You just have to get your hands dirty with this to enjoy the sweetness of the king crab. 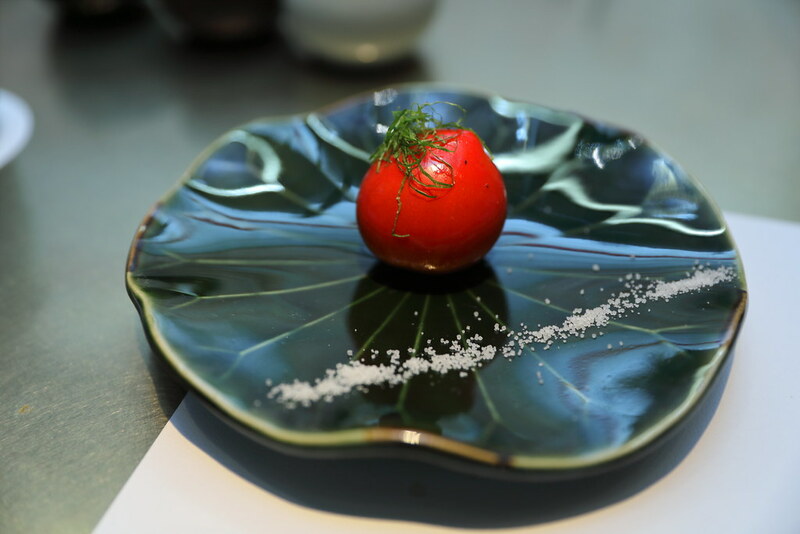 I have mixed opinion of the Fruits Tomato with Setouchi Salt. I can't deny the tomato was sweet but it is quite difficult for diners to consume it. As the tomato was grilled, it is too hot and difficult to cut through it with the teeth, not to say putting the whole thing into the mouth. I could see my fellow dining friends, struggling to have a way to eat it. 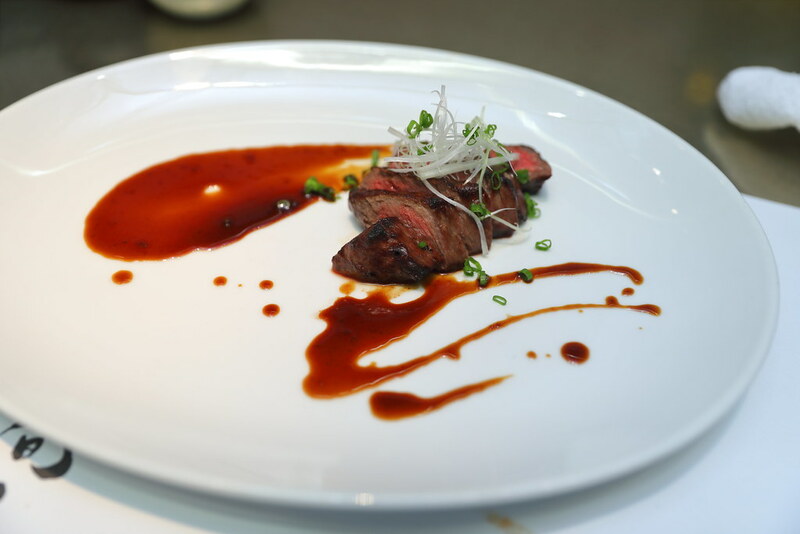 If you love a piece of good steak, then you should have the Kagoshima A4 Wagyu Beef Altchbone with Red Miso Fond De Veau. Simply grilled to perfection, allowing the natural flavour of the beautiful meat to shine with a layer of char sitting on the surface for a hint of smokiness. It was tender and juicy too. 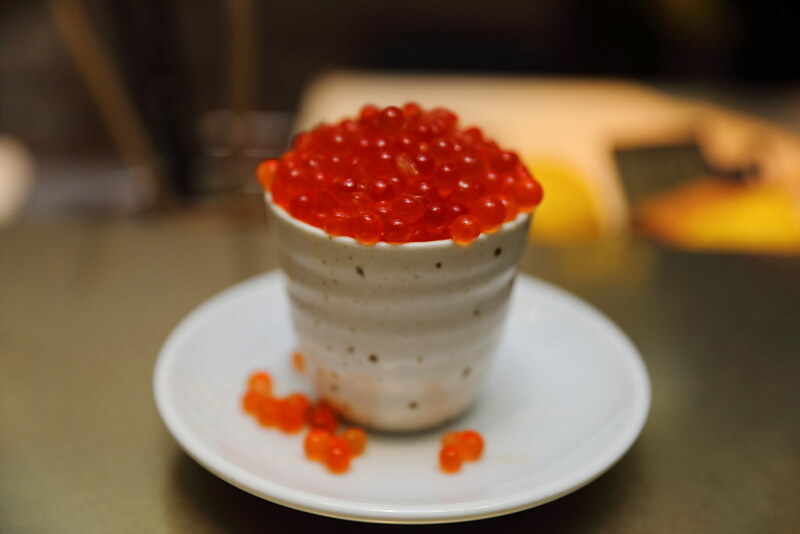 Diners have a choice of small, medium or large for the rice dish - Hokkaido Rice Nanatsuboshi Covered with Salmon Roe. The interesting part of this is you get unlimited top of the salmon roe which has been pre-soaked in a special dashi mixture from the chef. 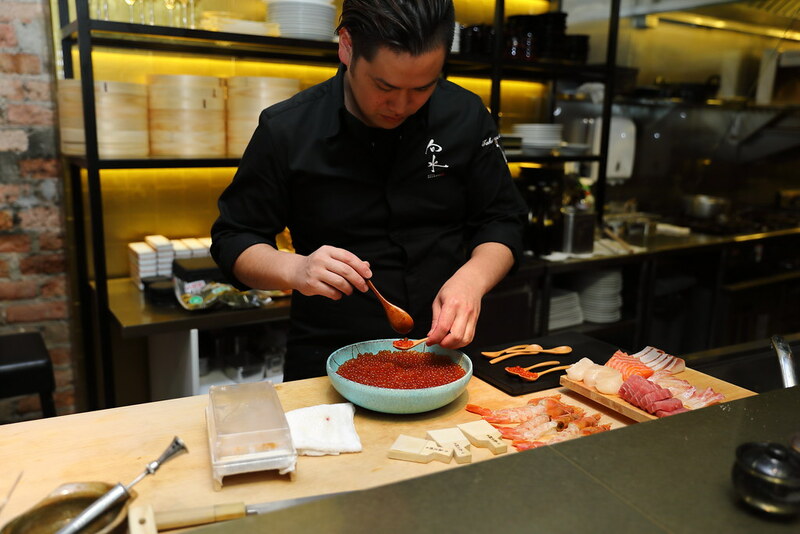 The chefs will chant "yoshio, yoshio'', as it pour scoop after scoop of ikura onto the rice until the guest says stop. It also comes with a bowl of miso soup with fresh nori seaweed. 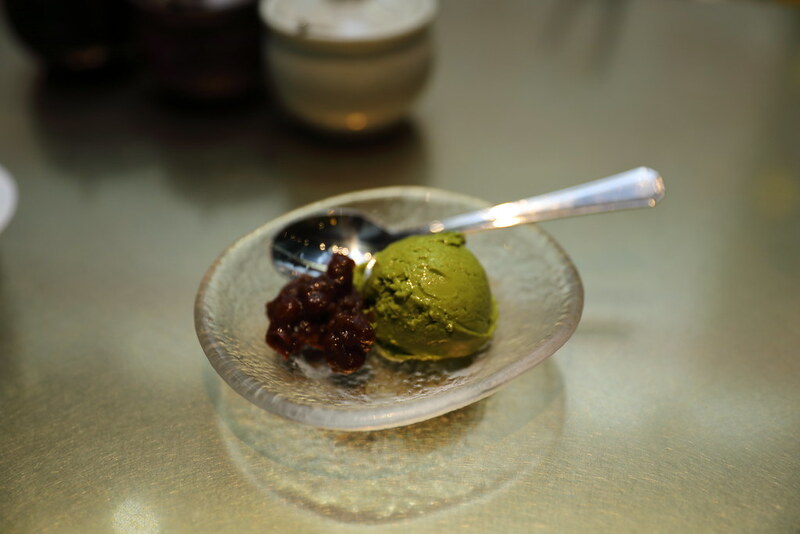 Last but not least, we wrapped up our omakase with Homemade Matcha Ice Cream with Red Bean for a sweet ending. 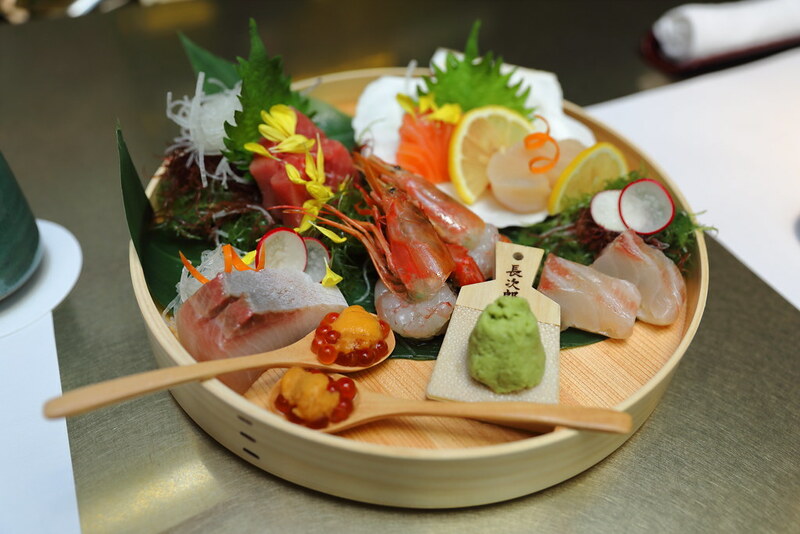 Aside from the Omakase menu, guests can also order from an ala carte menu that offers sashimi and other cold and hot appetisers, as well as charcoal grilled and deep fried dishes. These can be enjoyed alongside an extensive list of craft beers, umeshu, shochu, highballs, wines (red, white and sparkling), champagne and close to 40 different labels of sake.